Watched over by the striking Puig Campana Mountain, Melia Villaitana is an all-encompassing golf resort, the ideal location for golfers looking to kick back and relax in the Spanish sun. Despite the range of first-class facilities on-site, the golf courses are Melia Villaitana’s main attraction, both the Levante and Poniente were designed by golf's greatest player, Jack Nicklaus. Located less than 15 minutes from the vibrant town of Benidorm, just a 40-minute drive from Alicante Airport, golfers can enjoy the great local attractions such as the beaches, water park and Serra Gelada Natural Park. On the resort, you have superb amenities and outstanding service at your fingertips, including an extensive spa and numerous restaurants and bars. 1 in 8 free for 2019 travel dates. The Levante is the championship layout at Villaitana, and is widely regarded as one of the Costa Blanca's most challenging and enjoyable tests. In true Golden Bear style, there is much in the way of ‘risk/reward', where the brave may be richly rewarded for an aggressive strategy, however the penalties are sure to be severe if you stray too far off line. Very much in the mould of an American resort track, the Levante has pretty generous fairways and gentle undulations throughout, while the large greens are receptive, and maintained to a superb standard. At 7,297 yards, it favours the long hitters out there, but there is something to entertain everyone, not least the spectacular surroundings. The Poniente is Villaitana's second course, and is the perfect antidote to the lengthy Levante. Although the little par-62 layout only measures 4,017 yards, it is still enjoyable even for the highly skilled players, whose short game should benefit from the tricky short holes. Having a second course makes the resort incredibly appealing, as it is perfect for children, beginners, and those who are just looking for a leisurely round in the sunshine. The terrific golfing landscape also benefits from being detached from the resort's property development, ensuring a truly idyllic setting. The golfing complex has a first class practice range, which is over 300 metres in length. The magnificent accommodation at the Villaitana Wellness Golf & Sun Resort is housed within traditional Mediterranean style buildings, complete with minarets and domed roofs. Choose from the 4* Hotel Villaitana or the 5* Gran Hotel Villaitana. 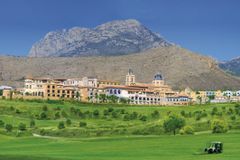 Overlooking the two tremendous golf courses, the Hotel Villaitana 4* has a total of 279 guest bedrooms, including spacious and luxurious suites, with rooms including features such as high-speed internet access, satellite television, top quality bedding and linen, and a balcony or terrace providing splendid views of the mountains. The Melia Hotel Villaitana 5* boasts 176 rooms, comprised of superior rooms and a number of opulent suites. By choosing the 5* accommodation guests will benefit from more space, a greater level of privacy and fittings and furnishings that have been elevated to an astonishing quality. The outstanding facilities are beautifully off-set by the relaxed ambience throughout the hotels, allowing visitors to relax to the full and enjoy the golf and leisure to the full as part of a holiday on the Alicante coast. Opened in early 2008, the spa at Villaitana is an exclusive complex, offering a heated pool with hydrotherapy, state-of-the-art treatment rooms, outdoor pool, lifestyle showers, Turkish bath, sauna and a fitness suite. The resort also has an outdoor swimming pool, spa facilities, games room, children's splash pool and tennis courts. Villaitana Resort is within walking distance of Benidorm - excellent nightlife is guaranteed. The Andra-Mari is among Alicante's best restaurants, specialising in authentic Basque classics, which also has a renowned wine cellar. Hotel guests are spoiled for choice; you can dine in La Casa Verde, La Barraca, La Alquitara or Le Colonial, which between them serve a vast variety of local and international cuisine. Could not have asked for anything better, staff were friendly and helpful, rooms were a good size, clean, and comfortable. breakfast was excellent. Lovely rooms . Only downside was noise at times from other residents in the corridors and challenging air conditioning. Excellent hotel with friendly and helpful staff, 5 swimming pools but water cold due to the time of the year, great Buffet breakfast. expect this hotel to be busy in the season. Short taxi ride of 10 minutes into the heart of Benidorm. We would certainly return. It's been a few years since my last visit here, and I found it to be much better now. It wasn't bad before, but the standard everywhere has been raised. Check-in and -out were easy and efficient, and staff were universally friendly and efficient and clearly motivated to provide excellent service. The bedroom was quite small but very comfortable, with good en-suite facilities and a balcony. Breakfasts were superb, with a huge choice of foods, eggs cooked to order, and great coffee. The bar had outside tables which was a pleasant place to sit and admire the architecture of the hotel. Hotel is ideal for golfers and conferences, I have stayed here a couple of times before but going out of season (January) we only had one bar open for drinks, breakfast lunch and dinner. Only off menu only! The last morning the buffet restaurant was opened and was very good. Hotel ideal for winter golf break. One minor criticism the restaurant for dinner very limited menu. Breakfast excellent a wide choice of food. Overall excellent. golf course Hotels don't come any better than this. If I had one complaint it would be the hotel is massive, so if you are not near the reception it can be quite a walk to the facility's. But all in all a really comfortable stay. Our room was in the 5 star section of this hotel & was large & well furnished & comfortable. It had a sofa, armchair & 2 desks, a well-stocked fridge & a separate dressing room & storage area. There was also 2 doors to an external terrace with furniture, which was excellent for sunbathing in November (20*C)! The beds were very comfortable & it was so quiet at night that your sleep was not disturbed.The staff were brilliant, & we ate an excellent breakfast each morning seated on the external terrace next to one of the swimming pools. Hotel and room very good once we turned off the air con which was heating the room too much. At this time of year resort was very quiet maybe a little too quiet for some but Benidorm is on the doorstep. Rooms really spacious & very clean. Staff very friendly and helpful. Lovely environment in a peaceful setting .Close to local amenities. been here six times so all in all very good,i booked the same rooms as the previous year with loads of notice but where given rooms in the main block. The actual hotel is fantastic especially the pool areas. The only thing that let it down was the rooms are a bit tired looking . We booked 3 twin rooms but we where told on arrival we had been upgraded to a family suit.problem is for 4 men only 3 beds plus a sofa bed with no linen.we managed to get some bedsheets the next day only for them to be taken again the following morning. Apart from this we enjoyed our time at melia villaitana. The hotel which is a reproduction of a typical Spanish is wonderfully recreated . The layout of the many swimming pools is tastefully done and well thought out. Rooms very comfortable and as we had a south facing balcony great for sitting out. Breakfast variations plentiful and of good quality. Bars reasonably priced, the overall atmosphere of the hotel is relaxed and enjoyable. Great hotel, Great Golf courses, More organisation needed for golf buggies. Staff very unhelpful to one of our party who lost a bag. Eventually found on Saturday. We were asked by member of staff at breakfast what improvementcould be made. We asked for tea and coffee in room. Later that day a kettle arrived. The next day a couple of packs of tea and sugar. No coffee no milk. Bar service very slow . The hotel is great. Loads of space, excellent rooms, fantastic pools and a beautiful elevated location with wonderful views. As per previous visits this is a great venue with excellent facilities all round, accommodation, location, staff and golf. All well organised by you guys at Your Golf Travel, thank you. can not fault it really, we are goimg to book up and go next year. My caddy tip: "keep it to the left to take out big right hand bunker." My caddy tip: "leave the driver in the bag." Booking was no problem, second time iv'e visited last year, going again this year. Beautiful hotel can't fault it, staff very friendly, overall could not fault it. My caddy tip: "long course, 1st is 2 big hits, keep it right trouble on the left." My caddy tip: "6th hole be accurate, but trouble all over the course. Try to be as accurate as possible and plan ahead." Premier room , can't go wrong with that. All the staff is excellent. My caddy tip: "Keep out the bunkers." Stableford score: 39 or more. My caddy tip: "Bring loads of golf balls, and leave the driver at home." A lovely place to stay ( if your playing golf )We like everything about it. We've been there for the last 5 years. The 19th hole is also very good overlooking the golf course . Food there is also very good and good choice. My caddy tip: "Keep out of the bunkers. They are very hard." Favourite hole: 1 st hole never any problems . With the ravines it is a tricky course even the short holes you have to be accurate but great fun. My caddy tip: "Don't try to be aggressive try being accurate." My caddy tip: "Take plenty of golf balls and use your head." This was the best golf tour ever, the resort was fantastic. My caddy tip: "Great holes all around the course. Keep it straight." My caddy tip: "Good short course, makes you think. Correct club selection is key." Course design was excellent. Bunkers however were badly maintained. My caddy tip: "Keep it straight." YGT arranged our visit, no hitches! Perfect. We really enjoyed our stay and only 12 minutes from Benidorm. you can leave your clubs in a secure room down next to the start, saves dragging them back and forth. plenty of pools for a dip. Would return no problem. My caddy tip: "Good course,a few bunkers,so practice your bunker game." My caddy tip: "Short course, but great to play.some testing shots." You always seem to find us something new and exciting. Can't wait to see what you have in store for us this year! My caddy tip: "So much more of a challenge." YGT is the best company that I have travelled with with our group. Surprisingly everything went so smoothly from the airport and transfers to and from hotel. Great!!! The staff were friendly and helpful. Our rooms were fantastic. Best I've had on all our golf trips. My caddy tip: "3rd. Hole / Keep it on the fairway." My caddy tip: "13TH. / Take a lower club than you think. Better to be a bit long as often lots of trouble short." My caddy tip: "Most holes are a challenge with lots of bunkers at driving distance." My caddy tip: "Some holes are drivable with a couple of silly holes much preferred Levante." YGT are always knowledgeable and helpful. The Hotel is formed like a traditional village, with reception, a bar and shops around a square. Buildings were really impressive and gave a lovely atmosphere. Reception were excellent, very helpful with restaurants, taxis and an overcharge refund when someone charged a spa treatment to the lads room, when we were all out on the golf course. You can also have a 5* service option in a separate part of the hotel where drinks are included. Rooms were really nice, well looked after. 2 big pools, one with a beach. Poolside bar and restaurant, tapas restaurant, Italian restaurant, bar on main square plus small shop. Great views from the pools over the local area. Would definitely use this Hotel as a base again , play each course once , then book rounds on nearby courses. The hardest bit was that there wasn't anywhere to store your golf clubs at the golf centre... Only 200 metres from the hotel , but the transport wasn't always available ....the golf management could do with offering a golf club lockers. Again this may have been sorted, hope so. Very helpful but occasionally a slow response in providing quotes. We chose it for its value and it delivered on that score. My caddy tip: "Really nice course, good condition, a few blind shots. Pay for buggy locally once you arrive." My caddy tip: "A nice par 3/par 4 course, but not in great condition. That might have been sorted now. Glad we played it though." My caddy tip: "Not a manicured golf course but excellent golf holes and some great views. Tees, fairways and greens in good condition. Avoiding the bunkers will help your score as they are numerous, big, hard surfaced and poorly maintained. Avoid the bunkers." My caddy tip: "Definitely the second ranking of the two Villaitana courses but a playable and enjoyable alternative to Levante. Lots of short holes, each one OK in its own right but you get fed up with them. One of them ridiculously short. Very hilly and long walks so buggy essential but fortunately included in green fee. Take more club." My caddy tip: "Nice resort course - pretty open & greens were good." My caddy tip: "Much shorter than the Levante course - still good fun though although a couple of the par 3's were only about 60 yards......if playing four rounds at the resort I'd recommend 3 on Levante and 1 on this one." My caddy tip: "Stay out of the bunkers, they are full of crushed shell not sand and prove to be very very difficult to get out of." My caddy tip: "Make sure that your short game is up to scratch." Perfect but I am afraid now that the prices in Spain seem to have gone up quite a bit. We had a great junior suite with a view of the fairway - 5 stars. Favourite hole: The first and last are the best for me but there are no weak holes. My caddy tip: "It is much harder than it looks. That is I think a feature with most of The Golden bears designs ." My caddy tip: "The same tip as some previous players gave me . Don't think that because it is short that it is nothing less than a very serious test of your game ." Very good hotel. The 2 courses were very good but could do with a bit more sand in the bunkers. My caddy tip: "Get a buggy." My caddy tip: "Go a club longer than normal." Great value resort, suitable for all levels of golfer and mixed groups. Difficult to beat for value for money. Favourite hole: 10th, 12th and 13th. My caddy tip: "Take safe lines off the tee and avoid the bunkers." My caddy tip: "Attacking play may not be the best option." I am in the process of booking my next trip with YGT. They are very Customer Focused and will always do their best to give you the best deal possible. I find Richard Van Der Putte an excellent and helpful guy to deal with. Excellent Hotel in a lovely setting.The Spa was very expensive and also the drinks in the bar on site.This aside we had a great stay here in the Hotel and also really enjoyed the golf.Would do it all again. Overall a great venue for a lads weekend golf break. Recommended! Excellent value for money although the condition of the Poniente course was a real let down & the lack of availability of buggies was also an issue. Favourite hole: 10th - good drive to the right of fairway will leave a great approach as long as you avoid the water! My caddy tip: "Generally wide open! Open your shoulders & enjoy yourself!." My caddy tip: "Stay in the buggy! Even though a very short course its very hilly & greens difficult as they're in an awful condition. ."
Been on trips with YGT now for the last 8 years & fantastic service every time would recommend them to anyone. Fantastic hotel would recommend to anyone to stay there, about 10/15 mins from Benidorm in a taxi about 12 euros. Are group have already booked to go back again. My caddy tip: "All holes were in great condition & the with fantastic views." My caddy tip: "For a par 62 this was a fantastic & very challenging course some great par 3's." Stableford score: 28 or less. My caddy tip: "Buggy required, would be a hard walk. Don't need your driver too much." My caddy tip: "It's long with plenty of bunkers, so play to avoid them. It's a well used holiday course, well laid out but worn." This was my fifth trip to Villaitana (group of 8 of us) and must say once again we had a great time. The hotel is superb we had great rooms with suites and balconies overlooking the golf course. The pools are amazing and breakfast plentiful - no complaints on this front. The golf course is good apart from the fact that the bunkers are a joke with hardly any sand in them and very difficult to play especially around the greens. If they sorted this out it would make a vast improvements as the course design, fairways and greens are excellent and ideal for Holiday golf. Benidorm is of course not the best resort in the world and it is difficult to find top quality restaurants but we managed. All in all another great trip with the hotel being the star of the show. My caddy tip: "Stay out of the bunkers." My caddy tip: "Course can be tight in places but not overly long." My caddy tip: "Great layout, Greens very good fast and tricky.... generous fairways so good fun. Get your ball on the right level of green..... some very tricky greens especially if your in the wrong spot." Room was fabulous. We were upgraded to the 5 star suite. Golf courses were great. Really enjoyed playing there and the two courses were quite different. Lovely pools at the hotel. My caddy tip: "Really interesting and different, avoid the bunkers". Favourite hole: 1st knowing that there are 17 more to follow. My caddy tip: "A buggy does help". Favourite hole: 2nd - par 3 - A great hole. Have used YGT five or six times now I think that says it all. My caddy tip: "make sure you are well practised with your fairway woods and long irons." My caddy tip: |Take plenty of balls with you... you are going to lose some." My caddy tip: "7 - Longer than you think but keep right. Aim to the right of the pin." YGT were excellent to deal with they even arranged a transfer for us! What a place amazing 😉 we went as a group of 16 all ages with hcps ranging from 3-18 great location golf on your door step 10€ into the old town a truly wonderful trip. All in all a super layout only issue we had coming from Scotland was that the bunkers needed some work tees greens & fairways brilliant really enjoyed it. Wonderful quirky golf course not that long but when the wind blows, great fun. My caddy tip: "Keep calm the chance to score will come." FANTASTIC COURSE, EXCELLENT STAFF, beautiful Views. Have already recommended the hotel to our wives as a venue for their girls trip! Decent track, course condition was a little tired in places, buggy not necessary. My caddy tip: "Shorter of the two courses but more interesting than its big brother - buggy necessary - some lovely elevated tees." Thank you for arranging the golf break to Melia Villaitana that my son and I have just enjoyed. When my son suggested the break a quick call to you was all it took for us to have some fantastic options, having made the choice of destination the booking was smooth and trouble free. The resort was perfect for us with everything we needed on site and reasonably priced. The contrast in the two courses made for an excellent holiday golfing experience. Unfortunately neither of us managed a birdie but plenty of pars and some quality father and son time. The odd gorse bush on my home course will hold no fears now after the spectacular challenges of the Poniente couse. We are already looking forward to our next holiday with you. Villaitana really ticks all of the boxes when it comes to the package golf holiday. The two golf courses are excellent and offer lots of variety that I’d imagine would appeal to golfers of different abilities. The conditioning and pace of play are both pretty good for a resort course and the challenge of each is considerable yet enjoyable. The hotels (there are both 4 and 5* options) are both fantastic and offer plenty to do if you just want to stay on the resort and relax. Those who want to explore can find their way to Benidorm in no time at all, while Alicante is only about 40 minutes away. Great value for money is another bonus and even when you’re on resort, you’re not fleeced for money, with food and drink being very reasonable. Not always the case at a 5* resort! As ever, YGT were really good and took the stress out of the organisation process. Thanks to all and Villaitana for a great week away in the sun. We have just returned from a 4 night golf break to Villaitana Wellness golf & Sun Resort booked through YGT. We arrived at hotel after easy journey from Alicante to Benidorm (40mins) to find we had been upgraded to junior suite. The room was lovely and clean with a huge balcony looking over the championship course. Our first round was played on the shorter Poniente course, which has some really tricky, interesting holes. Buggies are mandatory and boy do you need them with lots of ups and downs across valleys throughout the course. Our second round was on the Levante championship course which boasts an excellent layout. There’s a bit of water in play and a couple of long par 3's that add to the challenge considerably. Our final round was back on Poniente, which plays much better second time around. Both golf courses were in excellent condition. In the hotel, the breakfast buffet was very good with lots of choice, free UK papers and pleasant and helpful members of staff. Benidorm was just 10 mins away by taxi which only costs about 12 euros each way and there’s a huge choice of entertainment in town. Overall this is an excellent package and I would recommend it to others for sure. Having just got back from the Melia Villaitana Wellness & Sun Resort I can't recommend it enough! Travelling in a group of 9 we experienced quick, efficient service on checking in to the hotel (even though we were 2 hours early). The rooms were spacious, clean and well maintained. We played both golf courses and found both to be in good condition, with the short Poniente course being particularly tricky! Our only grumble would be the sparseness of the sand in the many bunkers on the course. This didn’t make the old sandy saves very easy but I guess we’ll have to actually avoid the bunkers next time! After golf, the clubhouse was very really nice and beer was served at a reasonable price...a bonus when you’re staying at a resort like this. The hotel was a 10 minute taxi-drive from Benidorm which was nice and convenient...close enough to get to in the evening but not so close that it was on your doorstep. I'd rate the whole trip as a 9/10 with only a few very minor things that could be improved. We'll definitely be back to book our next trip with you guys and might just consider a return to Villaitana. most enjoyable, my favourite of the two course's although the greens were very fast. a nice course to start with, very challenging. Would all come back again. Really enjoyed our golfing, good speed, challenging holes, the complimentary buggies were great. Lovely views of the mountains and sea, all enhanced by the beautiful sunshine we enjoyed. Another good course at the Melia long par 4's with a few challenges along the way. Ideal to hire a buggy on this course. thoroughly enjoyed the course along with my fellow golfers. Very good course in perfect condition, some challenges with bunkers, however very enjoyable round of golf. A really enjoyable short course with ten par 3s and eight par 4s. Some of the 3s were really challenging and the 4s were pleasantly long. Buggies were provided in with the cost and, as a round took only around three hours, we played twice in one day. Quite a quirky little course, but a good challenge to the handicap nonetheless. Definitely worth playing, and worth playing twice! It's been a number of years since I last played the Levante and it was in great condition. The greens were lightning fast on our first day which made them extremely challenging. On some greens with a slope, a placed ball would take off down the green and, on two holes that I recall, would run off the green and into water, with no rough to catch them - that's harsh. Really enjoyed the course, though, we played three times and, on the third time, the greens were more forgiving and we all ended up taking 10 or 12 strokes less. A general point, and not the fault of the course or its management as they have signs displayed, but players were leaving bunkers unraked and didn't repair pitch marks. It made us wonder what they do at their home courses. We were each repairing three or four pitch marks on every green and we gave up on the bunkers after the first round and deemed them out of play, they were so covered in footprints. We'll definitely be back though! Tricky but very interesting short course, par 3's and 4's most of which had a carry! Not for beginners or wayward hitters, you would need to take a lot of balls with you. We had a golf cart but you had to keep to the path, so it would of been better to have a trolley, the course was flat enough. This was a really good course, with excellent greens that were difficult to read, so you often needed 3 putts! Wayward shots were punished since you often could not find your ball, but the bunkers were good & easier to get out of. We really enjoyed our round of golf which took about 4.5 hours. WE started our round at 11am on Sunday, & the course was very busy. As expected, many of the golfers were rather wayward, & so progress was very slow because it was easy to get into trouble & lose balls if you went into the lush vegetation or one of the many hazards. The only real disappointment were the standard of the bunkers, some of which were compacted white stone rather than sand. We found the club had changed our booking from 11am on Day 3 to 10am on Day 2. This was due to a planned competition. However no one informed us and we turned up at club house at 11am to play Poniente as booked. They were however very helpful and we played Levante at 11.40. Great little course and probably more challenging than Levante. Unfortunately the voucher information was at odds with the booking. The club booked us on this course on day 3 rather than day2. A challenging course for beginners. Bit daunting and unexpected to be paired up with better player at the tee box. Worked out fine nice guy but a bit of warning would have been good. Some holes had difficulty. Scenic course. Definitely needed the buggy! First round was very busy but starters paced tee times out to help pace of play. as alway to meany people on course always a slow round.you will wait on nearly ever tee. The course wasn't in the best condition lots of divot marks on very slow greens. Unfortunately most fairways and green approaches were being heavily sanded in preparation for a European seniors match and buggies were not allowed on the fairways. Due to the layout of the course this made them somewhat of a liability. The only reason you would use buggies is the green to tee distances. The poniente course is very short and comprises of a lot of par 3 holes and quite short par 4s. Whilst this sounds easy and boring it was actually very well set out and quite challenging. Greens were ok and fairways good. Lack of accuracy can lead easily to losft balls. Challenging course. But great fun. All in good condition. Unfortunately the time we went they had just sanded and seeded the fareways which stopped the run of the ball but otherwise great. Really enjoyed as was expecting a pitch and putt but it was great. Fantastic course. Every hole different and every one a different challenge. Added to this the scenery is brilliant. If we return next year, we will do 2 rounds on this course and only one on the Levante. A beautiful looking course suitable for medium / high handicappers. The greens and especially the bunkers were in very poor condition and don't match the standard of the rest of the golf course and club. A tricky little course that tests your short game. Looks good, great location but sadly let down by poor greens and shocking bunkers. Good tricky little course, very much up and down, tester for your short game. Good course excellent for holiday golf ie not to difficult but hard enough challenge. Course time about 4 hours. Buggy organisation much improved this year. great short course with lots of challenging psr 3S!. Do not walk this course. great fair wide open course in great nick. Lovely little course, some amazing holes.Great views and very well maintained 5star. Lovely course, fairways and tee boxes well maintained, greens were very slow tho but nice.